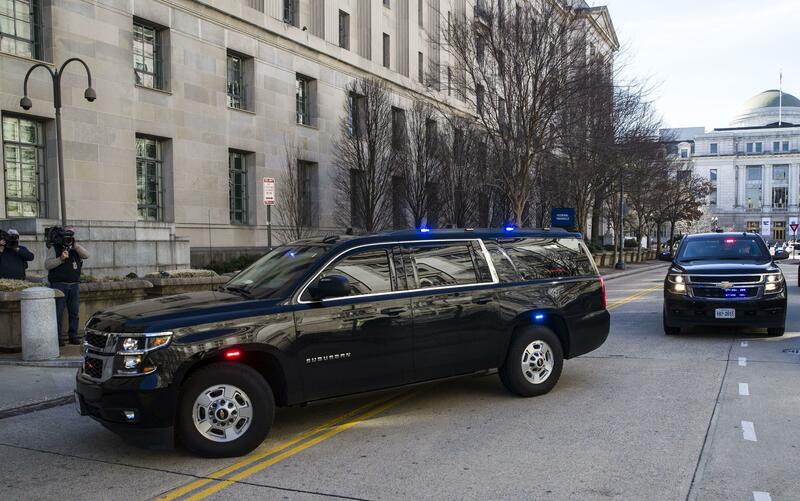 The motorcade for Attorney General William Barr arrives at the Department of Justice, Sunday in Washington. Barr has released his first summary of Mueller's findings. 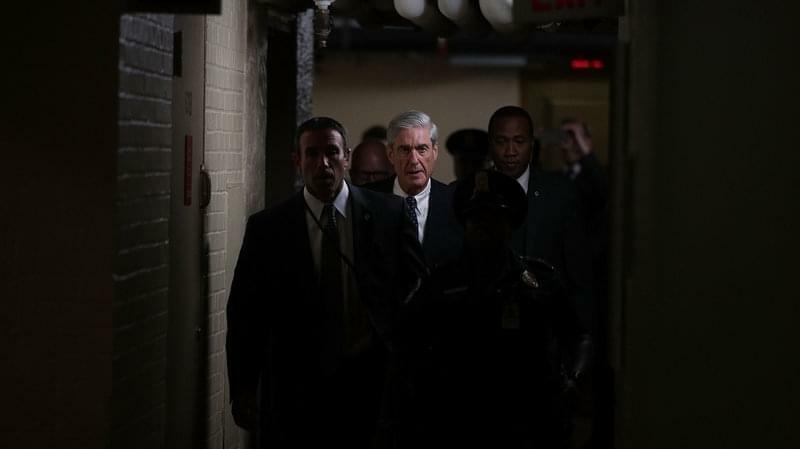 Special Counsel Robert Mueller did not find any evidence that President Trump's campaign conspired with Russia to influence the 2016 election; but his report takes no position on whether the president obstructed justice, according to a summary of findings submitted to Congress by Attorney General William Barr. "[W]hile this report does not conclude that the President committed a crime, it also does not exonerate him," Barr wrote. 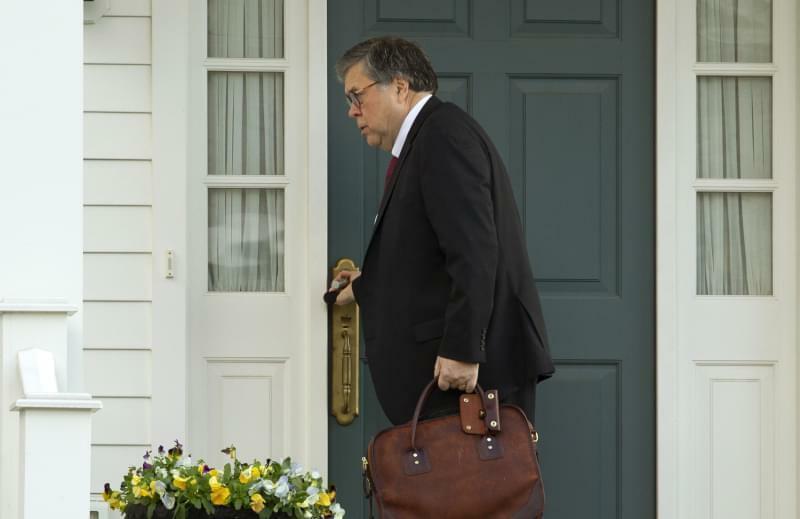 The Justice Department leaders reached that conclusion, Barr wrote, without regard to the "constitutional considerations" that surround whether the department could seek an indictment of a sitting president. Shortly before departing Florida for D.C., Trump called the investigation "an illegal takedown that failed." Trump also said, "Hopefully someone's going to look at the other side," seeming to suggest he wanted an investigation into his 2016 Democratic opponent Hillary Clinton, an investigation he has called for several times. At Trump's rallies, there are frequent chants of "Lock her up!" Senate Judiciary Committee Chairman Lindsey Graham, R-S.C., who played golf this afternoon in Florida with the president, said in a statement, "Good day for the rule of law. Great day for President Trump and his team." House Minority Leader Kevin McCarthy, R-Calif. said, "It is abundantly clear, without a shadow of a doubt, there was no collusion. ... This case is closed." Collins also urged House Judiciary Committee Chairman Jerry Nadler, D-N.Y., to "rethink" the committee's investigation and shift to focus on issues like immigration and criminal justice reform. Mueller has not been at the Justice Department this weekend, and he "was not consulted on this letter." The Justice Department is not giving a timeline as to releasing additional material from the Mueller investigation, and it will review the report and materials for grand jury information and for information that could implicate ongoing investigations. The president's legal team has drafted a rebuttal to Mueller's report, but the decision as to whether or not to release that will depend on what Mueller wrote, Giuliani said. "If they don't say anything harmful or critical that's worth responding to, we won't respond," he said. "If they do say something then we'll put out whatever is necessary to rebut it." Supporters of the president welcomed the news on Friday from the Justice Department that Mueller hasn't recommended any more criminal indictments. They say this shows the story is over and that, according to this line of thinking, Mueller didn't uncover any conspiracy between Trump's campaign and the Russians. "If they're not going to indict anybody else then they can't have any further evidence of collusion," Giuliani said. "Otherwise they would have brought some kind of conspiracy indictment." Trump's former campaign boss Corey Lewandowski pointed specifically to the case of conservative commentator Jerome Corsi, who walked away from a potential guilty plea with the special counsel over alleged lies to investigators. The government doesn't appear to be pursuing that case, Lewandowski told NPR on Friday, which he said suggests to him that this chapter is about to close. "I'm reading the tea leaves," he said. Calls have been nearly universal and bipartisan for Mueller's original report to be released, and for the public or Congress to access its findings and its underlying source material. "It needs to be released to the Congress and it needs to be released to the American people," Sen. Ted Cruz, R-Texas, told CNN on Sunday morning. "This has consumed two years of the American people's time and we need full transparency." Congressional Democrats appeared nearly unanimous about the need for wide release and individual Democratic leaders also tried to preempt what they feared might be attempts by the White House to conceal Mueller's findings. Nadler, the House Judiciary chairman, told NBC on Sunday morning that he thinks the president shouldn't attempt it. Continued Nadler: "In that case, the Supreme Court, nine to nothing, ordered that all the claims of executive privilege be overridden and the tapes be public ... The president may try to assert it, may try to hide things behind it. But I don't think that's right or be successful." Trump, for his part, has said in the past both that he doesn't mind if Mueller's report becomes public — because he says he has done nothing wrong — but also that there shouldn't have been a Mueller report in the first place. That idea is a "hoax" perpetuated by conspirators and Democrats sore that Hillary Clinton lost to him, Trump says, who have been consequently running a "witch hunt" against him. 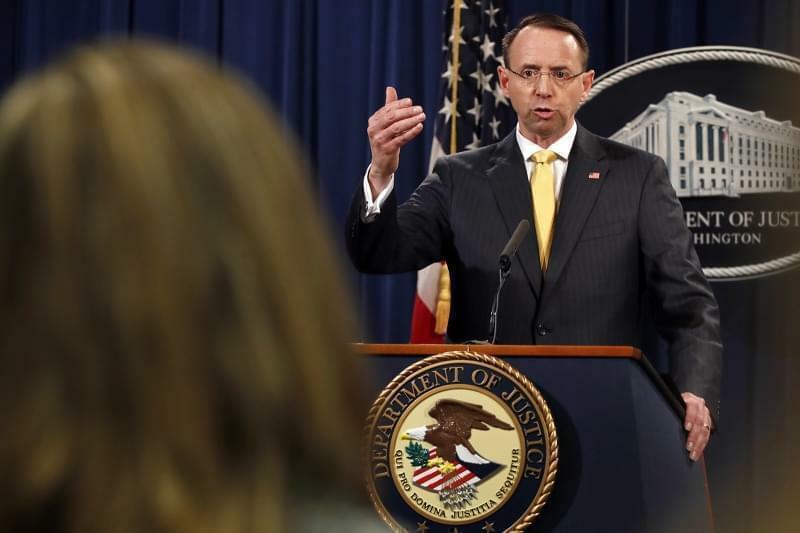 If a near-consensus had formed on Sunday about the need to release Mueller's findings and his evidence — at least to Congress — what remained unclear was precisely what would happen next with Barr and the Justice Department. Updated at 3:59 PM Central Time. NPR White House correspondent Tamara Keith contributed to this report. Atty. General Barr's letter to the House & Senate Judiciary Committees, summarizing the main points of the Mueller report.